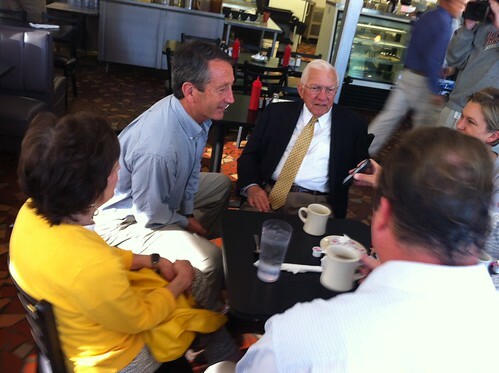 Mark Sanford and the "battle for the soul of America." This got Woodruff asking about a campaign dynamic that’s truly pleased Sanford: His ability to look like the scrappy underdog. Elizabeth Colbert Busch has a campaign bus, one that, yesterday, parked in a Charleston neighborhood as the candidate, reporters and staff canvassed. Hard rain beat down the entire time as ECB talked to four voters identified as strong supporters. So didn’t Sanford have a bus? Everything Colbert Busch does is meant to counteract this meme. 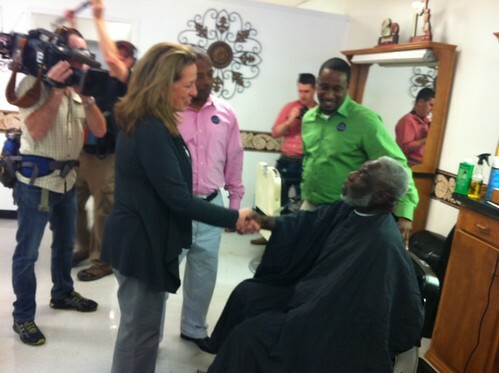 Invitations to her events are invitations from “Businesswoman Elizabeth Colbert Busch.” The bus, whatever its turning radius, is painted with the human-sized slogan “Elizabeth Means Business!” Her appearance today in a black suburban stretch between Summerville and Charleston happened at a barbershop, where she was shown around by the family owners.